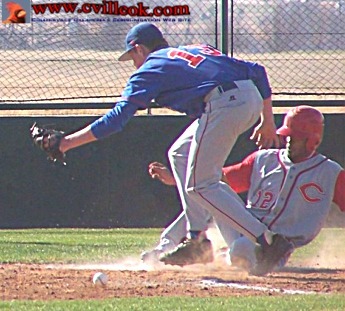 Trent Lee (#4) was safe at the plate with the 2nd Cardinal score Thursday against Bixby in the 1st inning. 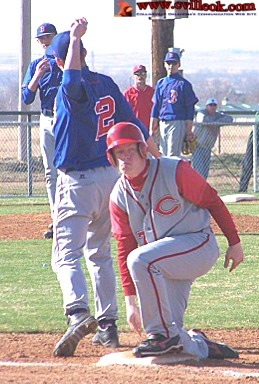 Brent Werdel had scored ahead of him on the same play as Bixby misplayed a Jose Olazagasti bunt. 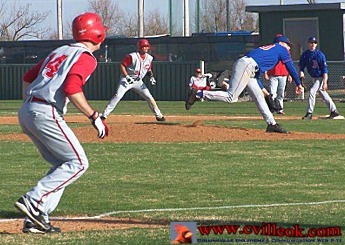 Peter Rodriguiz (#13) followed with an RBI single scoring Olazagasti for a 3-0 first inning lead. 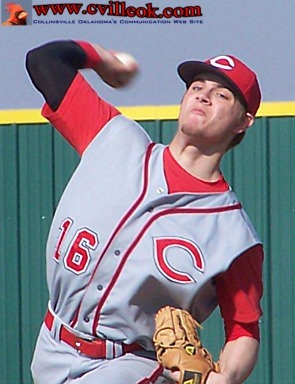 Randy Rogers (#16) pitched for the Cardinal win over Bixby Thursday. 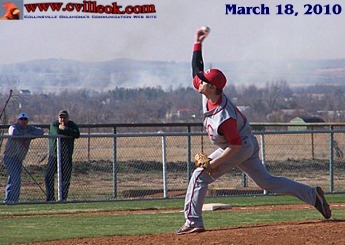 Grass fires were smoldering in the background (several miles away) as Rodgers pitched to the Spartans in the 4pm game Thursday. 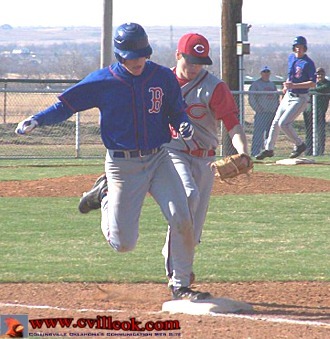 Bixby had two base runners on in the 3rd inning after this runner won a footrace to 1st base with Rogers covering from the mound on a ground ball to the first baseman. 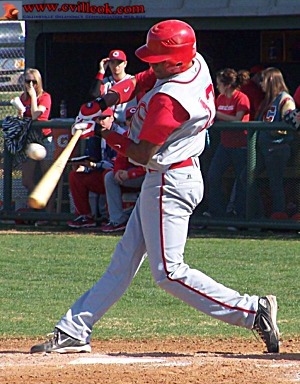 Jose Olazagasti (#12) led off the Cards half of the 3rd inning with a double and later scored above for a 4-0 tally. 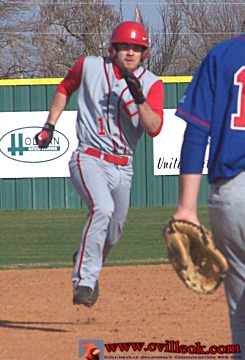 Gannon Jerom (#17 running for Kelly) avoided a pick off attempt in the 3rd inning. 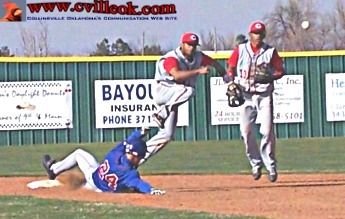 Shortstop Jose Olazagasti (#12) turned a double play to end Bixby's half of the 4th inning. 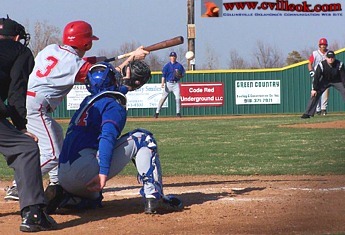 Brent Werdel (#3) advanced two runner with this sacrafice bunt in the 4th inning. 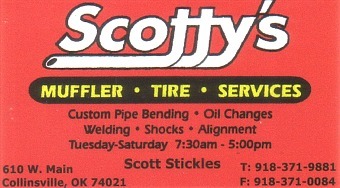 Tanner Robb (#1 running for Rogers) scored from 1st base on Nick Goza's 3-run triple in the 4th inning to notch a 10-0 score. 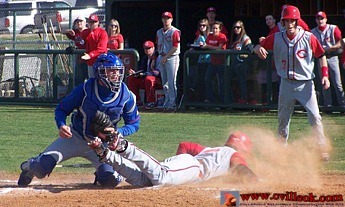 Collinsville loaded the bases again in the 4th after Goza's triple but didn't get another run across.